An air force plane has crashed into houses in the eastern part of the Indonesian capital Jakarta, killing at least six people. Witnesses report that eight houses are ablaze following the incident. The Fokker 27 turboprop aircraft came down near a street located in Halim Perdanakusuma air base during a test flight, say local officials. Firefighters have been dispatched to the crash site. The incident comes off the back of last month’s jet crash south of the capital that killed all 45 people on board. A Russian Sukhoi Superjet disappeared from radars during a test flight and collided with Mount Salak shortly after flying out of Jakarta. Investigators believe that human error could have played a significant role in that incident as the pilot requested permission to drop to 6,000 meters in a mountainous zone, violating the minimum obstacle clearance altitude. The Fokker F-27 has been involved in a number of deadly crashes over the last few years. The most recent also happened in Indonesia. 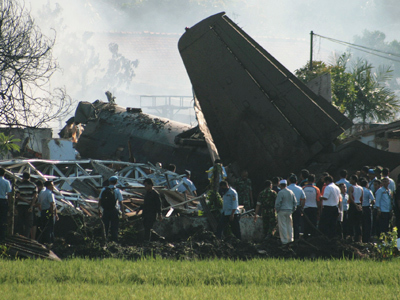 An air force-owned craft crashed down in the capital of Indonesia’s West Java province on April 6, 2009, killing all 24 people on board. The turboprop airliner was designed in the 1950s by Dutch aircraft manufacturer Fokker. Its production was discontinued in 1987.